A solitary point is rarely viewed as a cause for celebration but given the circumstances that unfolded at White Hart Lane on Saturday, I’ll make an exception. Having seen Francis Coquelin get himself needlessly dismissed and our one goal advantage turned into a one goal deficit within the space of just seven minutes, it is safe to say that I feared the worst. After all, it would not have been the first time the team has capitulated in this type of scenario. Arsene has frequently praised the mental strength and character of the players but in truth we have rarely seen them demonstrate those two qualities. However, at a time when Arsenal supporters least expected it, the team finally rolled up their sleeves and dug deep to get themselves back in to the game. In the past I have criticised the players for appearing to roll over for the opposition in similar circumstances so it is only fair to praise them on this occasion. When considering how the game unfolded, the team managing to secure a draw almost felt like we had in fact earned the victory. Whilst the disappointment of failing to win against ten men, despite having been in the lead at one stage, would have undoubtedly felt like a defeat for both the players and supporters of the home side. 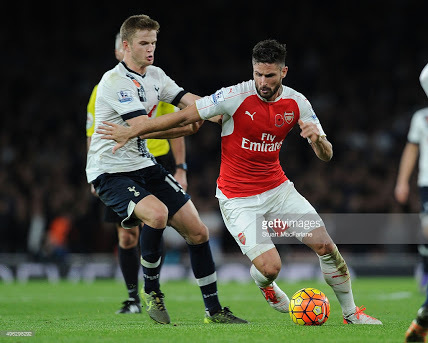 Had Eric Dier received a deserved second yellow card late on then we may well have gone on to record a crucial victory and you could argue that Erik Lamela and Hector Bellerin could have both been given their marching orders too. All I ask from our team is that they show commitment and desire and on Saturday they did exactly that. In my previous article I mentioned that I was intrigued by what qualities Mohamed Elneny would bring to the team and wrote that I had hoped there was more hiding in his locker than what I had seen from him to date. For the record, at the time of writing the previous article I had seen Elneny play on three or four occasions for Basel against English opposition and make three appearances for Arsenal. After paying close attention to Elneny’s performance against Spurs, although I retain the opinion that Mohamed appears to be neither a tough tackling defensive midfielder or one likely to be a regular goalscorer, I did see signs of a potential central midfield partnership with Coquelin developing. This perhaps provides the answer to my question in the way of suggesting that the Egyptian was signed to compliment Francis opposed to offering him competition. One thing I have always found interesting is how numerous people can watch the same game yet see it so differently. I was particularly surprised to read comments from some supporters stating that they thought we had played well in the first half and that Alexis Sanchez and Mesut Ozil had put in good performances. My assessment was that for the first thirty five minutes of the game we were very poor in possession and every time we won the ball, we proceeded to give it straight back to the opposition. I also thought Ozil was subdued throughout and that Sanchez had performed only marginally better than Mesut, prior to scoring our second goal. 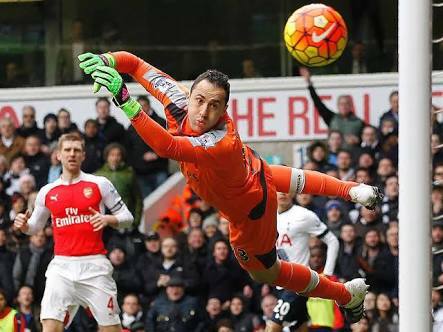 Some supporters also went overboard by describing David Ospina’s performance as world class. His save from Erik Lamela in the first half was a good one and showed quick reactions but let’s not forget it was close to him and at a comfortable height for him to get to. Then the supposed wonder save from Harry Kane’s second half effort, being only a few millimetres from completely crossing the line, was straight at him and only came about as a result of Ospina being nowhere to be seen when the initial cross came in in the first place, a familiar story for most aerial balls into our box when David plays. It should not be ignored that Ospina failed to hold on to two relatively tame strikes from Kyle Walker and Eric Dier either. Luckily he wasn’t punished after dropping their efforts back into the danger zone. The Columbian stopper also made his save from Christian Eriksen’s effort, appear far more spectacular than necessary. It is no secret that Ospina’s presence between the posts makes me nervous and it will certainly feel like a long, uncomfortable month until Petr Cech returns to the side. Despite ensuring that our pride remained intact, unfortunately we lost further ground on league leaders Leicester City and we now trail them by eight points with just nine games remaining. At this stage of the season that is a very big gap and were we eight points behind one of the regular title challengers, Manchester City or Chelsea for example, then I have no doubts that the majority of our fan base would already consider us to be out of the title race. I was trying to keep the article as concise as possible but I should have added that I don’t lay any blame at Ospina’s door for the two Spurs goals and that I was impressed by Welbeck’s performance. Spot on Nick, pretty much sums up how I saw things too. People fiddling themselves silly about Ospina but on another day his fumbles could have fell straight to one of their guys and bang bang we lose 4-2! Pray for Cech! Agreed with your comments, especially about Ospina. He’s not a poor shot stopper but it’s the rest of his game that gives me kittens, did it again last night against Hull. Made a decent save and then charged out whilst flapping like a crazed mad man! Seems to struggle more with the shots that go straight down his throat than he does the difficult ones. Ozil might as well not have been on there when he plays like he did against the spuds. lol, you will need to dangle better bait than that to get me biting….